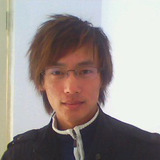 before executing this function, just select faces and click the button. Fixed some error problem with NURBSToPoly function. 'Original object' option is about choosing the state of selected objects after converted(Hide it, or keep it, or remove it.). only polygon object's faces, I set it apart from 'PolyToNURBS' function . do 'Isolate Selected', you can see them directly. The message you see if there are some faces not proper for converting is one of these. <- This message is printed when some faces are not quadrangle. included in these edges are not splitted even these edges are detached. So, this makes error when executing this function. So I set this to detect these weird components. In this case, you have to delete them and make them again. <- This message is printed when both of things happen when checking. 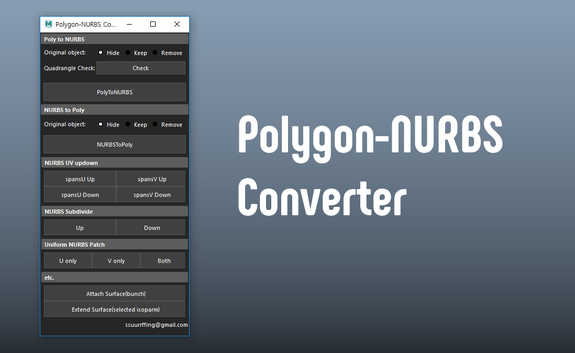 (Hide, Keep, Remove), and finally click the 'PolyToNURBS' button. and without some bothering modifications, just converting it with maintaining its original shape and number of its spans. Just the same as 'PolyToNURBS' above, it also has an option about 'Original object'. 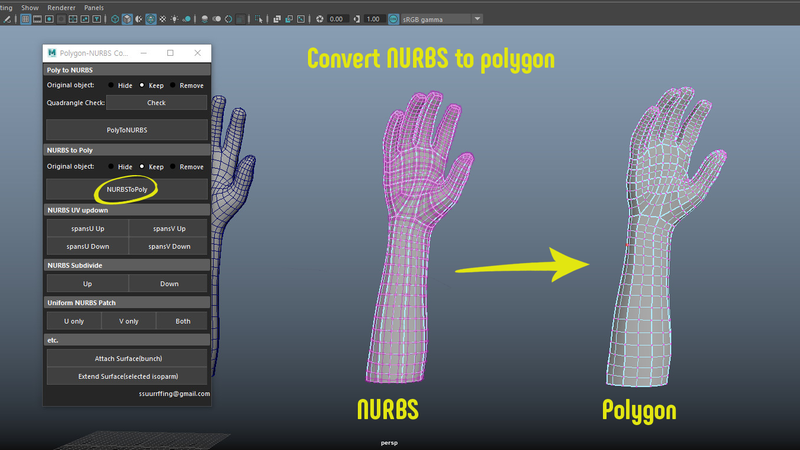 (Hide, Keep, Remove), and finally click the 'NURBSToPoly' button. Up or down spansU and spansV. 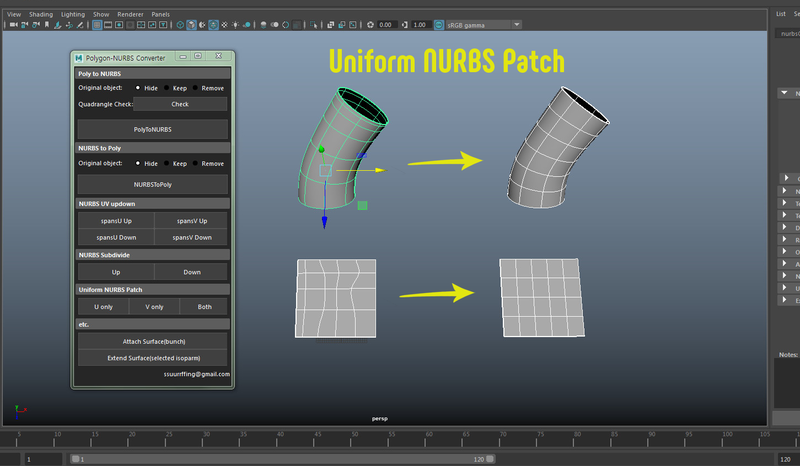 Script for uniformalizing NURBS Surface's control vertices. 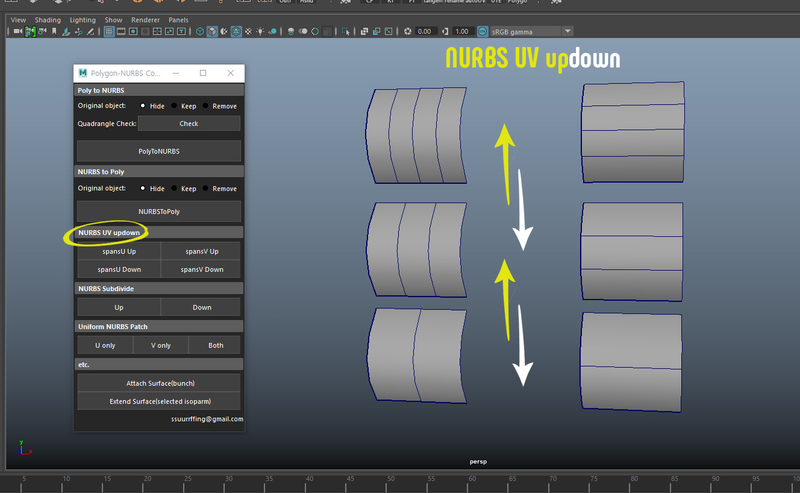 'U only' is only for NURBS Surface's cvU, 'V only' is for cvV, 'Both' is for both. 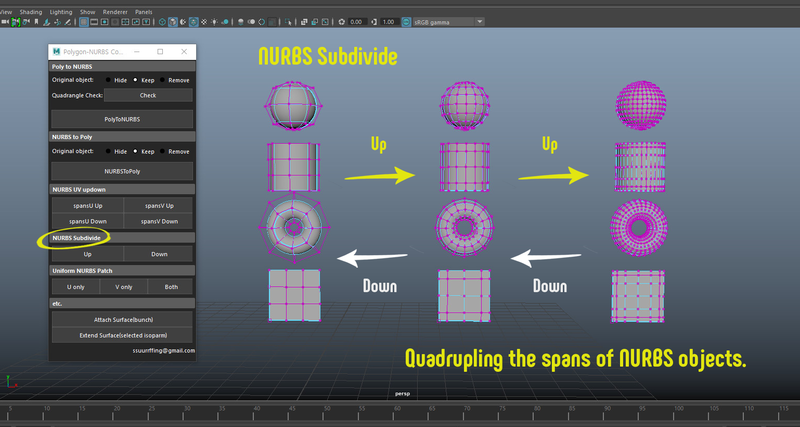 Attach all selected surfaces by their selection order. Extend surface from selected isoparm. 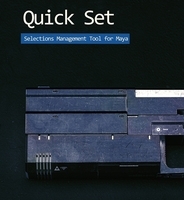 by clicking the icon once to activate these functions in Maya. 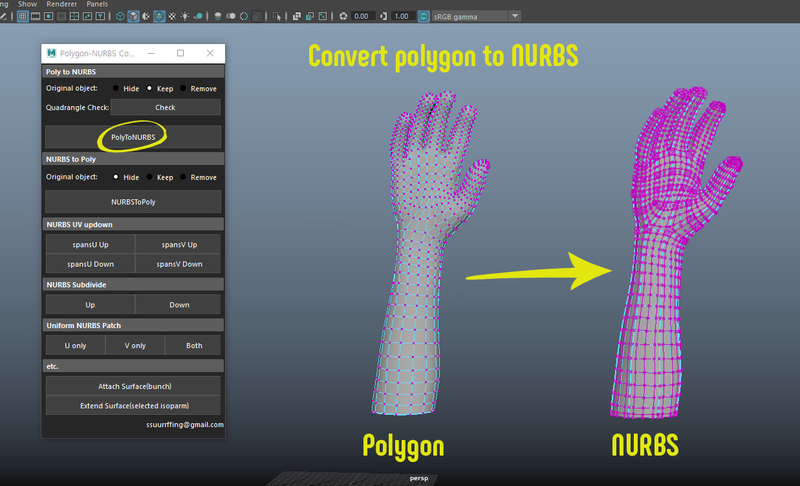 * This 'original object' arguement is connected to Polygon NURBS Converter tool's 'Original object' option. So if you write arguement as 'original object', it follows default option settings, 'Hide'. If you want to specify that option, write function like this. * It is same as PolyToNURBS' 'original_object' arguement above. * I can't access to composing email or sending message page in this site, I don't know why but still does. I can send you my reply and answer.